Organic cotton is grown without the use of pesticides, synthetic fertilisers, herbicides, fungicides or defoliants. It will have been grown without the use of genetic engineering. The seeds used are untreated. Instead of the toxic chemicals used by non-organic producers, the organic farmers will use methods such as crop rotation and beneficial insects. Organic farmers cultivate a diversity of natural enemies to prey on insect pests.These methods use the laws of nature to tip the biological balance in the cotton’s favour. The idea is to build strong soil which retain water due to increased organic matter within. 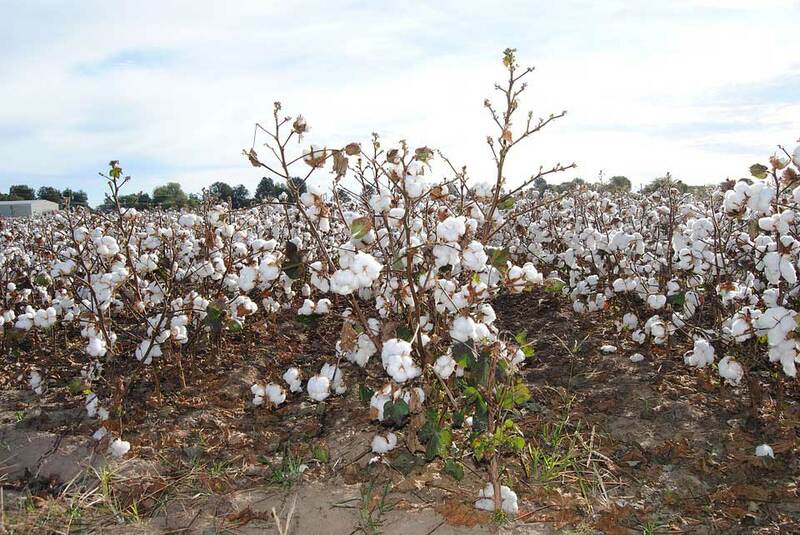 Sometimes trap crops are grown to lure insects away from the cotton. Weeding will be carried out by innovative machinery or by hand, rather than via chemical destruction. Seasonal “freeze” is often used for defoliation. To get their crop to be certified as organic, it must meet organic standards, with the soil free from synthetic fertilisers for at least 3 years. Conventional non-organic cotton is much more reliant on chemicals. the seeds themselves are typically treated with fungicides or insecticides. The seeds themselves will usually have been genetically modified. The soil will be treated with synthetic fertilisers. Since the soil will not retain water as well as organic cotton soil, more intense irrigation will be needed. The soil will repeated be used for the same crop (mono-crop) which will result is soil loss. Use will be made of herbicides to inhibit weed germination. To control pests, extensive use of insecticides and pesticides is made, frequently using aerial spraying. Conventional cottons uses up 3% of arable land and yet consumes 25% of the world’s herbicide. Defoliation will be carried out using toxic chemicals. It matters because the chemicals used in conventional cotton farming can be very toxic. The 9 most common pesticides are highly toxic and some are thought to be carcinogenic. Workers are exposed to breathing in and ingesting the toxic chemicals. There is also the problem of the chemicals getting into the water supply. An article in treehugger.com reports that 20,000 deaths occur each year from pesticide poisoning in developing countries, many of these from cotton farming. The use of aerial spraying can result in the chemicals drifting beyond the cotton plants to farm workers, neighbouring wildlife and local communities.